A typical woman is like this, a typical man like that »normal. Being in love goes like this »normal. Being happy, satisfied, calm and collected goes like this »normal. What about all of the atypical ways that we are? The strange, unique, not always easy or comfortable ways that we show up as from time to time or perhaps mostly? And we can shut down an essential part of ourselves, go into hiding… Limiting and damaging to our full flowering as potent, sexual, alive and distinctive unique human beings. 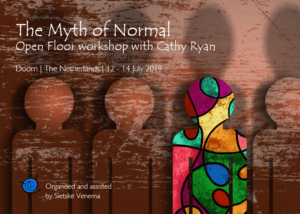 In this workshop we’ll take a look at the myth of normal around shame, sexuality and identity. We’ll explore some stereotypes, ask some questions, moving all the way with the Open Floor movement map as a guide. A pre-requisite of at least 10 hours of Open Floor Movement is required for this workshop; or other conscious dance form. This workshop is also a great companion to the workshops What A Shame and Libido Fundamentals. I would like to join. Link to subscription! Or do you have more questions: I have more questions. Misschien iets om te delen? © Dans je leven 2019 .